The answer is the same as all business related questions meaning you have asked the question the wrong way round. Instead the question is does my customer need, want, or demand me to have an app. Understanding that website is already mobile enabled is a must for all websites then think about this in the past it was the same question that was asked about websites do I need one. Which of course the answer was of course yes. Social media do I need to engage with it yes. Now ask the question does my customer want me to have an app. 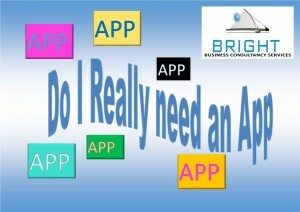 Below are a few reasons why you should engage why you should have an app for your business. You are Visible to your customers at all times. According to statistics show that the average European spends upwards of two hours per day on their digital devises mobiles tablets etc. Apps can digitalize that loyalty program you have in place. Instead of sticking to the old point-collection card, make it possible for your customers to collect their rewards via your mobile app. The result? More interactions, downloads and more return customers. Check in with our branding team to see how you can create a brand loyalty strategy. No matter whether you are selling potatoes or Gym services, your customers need a way to reach you. Having a messaging (or help desk) feature within your app can really make a difference in the way you communicate with your customers. The most important reason why you should consider building your own mobile app is customer loyalty. With all the different mediums of marketing both inbound and outbound marketing — roadside banners, billboards, flashing signs, newspaper ads, flyers, coupons, websites, website banners, Facebook ads, and email marketing because our customers are drowning in advertising we slowly lose our impact on customers. Because we are in a time in business were customers are the centre of our business and its imperative to be as close to our customers by building a good solid relationship by engaging and resonating with our customers while being only a click away makes it somewhat easier. All that being said yes you should be looking at making an App that works well with your business and the functionality is there to match what customer needs wants and demands. But yes you do still need an equally important website that offers a high level of functionality and promotes customer engagement. This entry was tagged App Development, Bright Business, Business Development, Cost effective, eCommerce, Web Design. Bookmark the permalink.